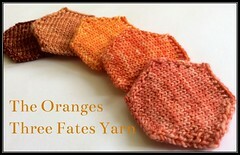 I swear, the closer I get to having this baby, the less time I seem to have for knitting! It is actually pretty frustrating, but I guess that is life for now. I am in the throes of nesting and my husband only being home 4 days out of the last 25 have really made me plan out my days. As sad as it is to say, by the time I get done with all the errands, chores, and toddler chasing for the day, all I want to do at night is just lounge on the sofa with my feet up watching re-runs of whatever law & order type show is on TV! I have been working on the same hexipuff for the past 3 days and it is driving me crazy! I just need this one off of my needles so I can start with a fresh one. Hopefully pictures of that one to come later on today! 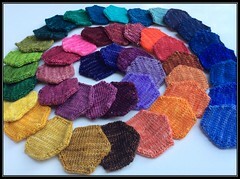 Here is a pic of the hexipuffs I finished the day I originally wrote this post! I am sort of getting back into the groove and have already knit 3 more hexipuffs. 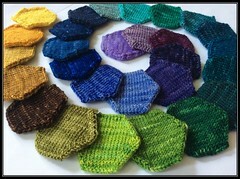 Sheesh, June is certainly going to be a poor showing for hexipuffs, but every little hexagon completed counts! 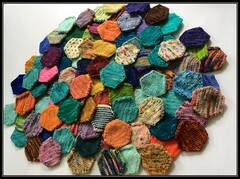 Goal #3 Met: 75 Hexipuffs Complete! 75 hexipuffs complete, another 25 in 32 days. Not nearly as efficient as I was the past two months, but that’s okay. I had quite a bit going on with visiting family and just generally being busy getting ready for Sir W’s arrival. I know that my reward for completing each 25 puffs was supposed to purchasing more mini-skeins, but I simply don’t need any right now! I know, I must not be a real knitter if I am turning down the opportunity to purchase more yarn! My husband is going to fall out of his chair if he sees anymore small Etsy purchases though so I will work from my stash for now. Besides, I just received my June shipment for the Chiagu Koigu mini-skein club and am itching to wind them up and get knitting! After I finish the teals of the Three Fates Yarn rainbow pack, I may take a break from them, just for a change of pace and get some more variegated yarns back on my needles. I can’t forget that I also have the red gradient kit from Black Trillium Fibres. So much yarn! That’s a good problem to have though! I will say, my next mini-skein yarn purchase will definitely be from Mermaid Knitting. I am missing the Rhichard Devrieze yarns!